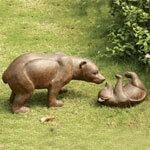 Bear Statues - Click on an item for more details! 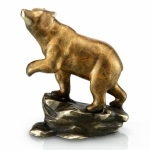 This Ursa Major Bear Statue is made of poly-resin with hand painted finish. The detail and craftsmanship are unparalleled. You are sure to find this exclusive art piece as your treasure trove of unique gift and decorative accent. 16.5 inches tall. 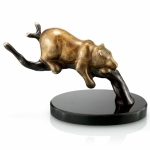 This unique Silver Bull & Bear Desk Clock is made of silver and marble with stunning detail finish, a perfect gift for the corporate awards. 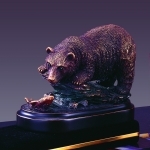 Silver/Marble, 4.5 inches H. x 9.75 inches W. x 2.5 inches D.
This Mama & Baby Bear Sculpture is beautiful and exotic. 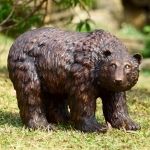 Bring the art of wildlife into your home or garden with the unparalleled craftsmanship and detail of this incredible work of art. The perfect accent to your home or garden and the perfect gift for the wildlife lover. Set of 2! 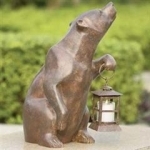 Alloy, 10" H. 5" H. 18" W.
Mama & Baby Bears Statue SOLID BRONZE and MARBLE!